Search for the complete list of publications in PubMed. Gontier G, Iyer M, Shea JM, Bieri G, Wheatley EG, Ramalho-Santos M, Villeda SA. Cell Rep. 2018 Feb 20;22(8):1974-1981. doi: 10.1016/j.celrep.2018.02.001. Ebata KT, Mesh K, Liu S, Bilenky M, Fekete A, Acker MG, Hirst M, Garcia BA, Ramalho-Santos M.
Epigenetics Chromatin. 2017 Jul 12;10:36. doi: 10.1186/s13072-017-0143-3. Global Hypertranscription in the Mouse Embryonic Germline. Percharde M, Wong P, Ramalho-Santos M.
Cell Rep. 2017 Jun 6;19(10):1987-1996. doi: 10.1016/j.celrep.2017.05.036. CHD1 loss sensitizes prostate cancer to DNA damaging therapy by promoting error-prone double-strand break repair. Shenoy TR, Boysen G, Wang MY, Xu QZ, Guo W, Koh FM, Wang C, Zhang LZ, Wang Y, Gil V, Aziz S, Christova R, Rodrigues DN, Crespo M, Rescigno P, Tunariu N, Riisnaes R, Zafeiriou Z, Flohr P, Yuan W, Knight E, Swain A, Ramalho-Santos M, Xu DY, de Bono J, Wu H.
Ann Oncol. 2017 Jul 1;28(7):1495-1507. doi: 10.1093/annonc/mdx165. Percharde M, Bulut-Karslioglu A, Ramalho-Santos M.
Dev Cell. 2017 Jan 9;40(1):9-21. doi: 10.1016/j.devcel.2016.11.010. Inhibition of mTOR induces a paused pluripotent state. Bulut-Karslioglu A, Biechele S, Jin H, Macrae TA, Hejna M, Gertsenstein M, Song JS, Ramalho-Santos M.
YAP Induces Human Naive Pluripotency. Qin H, Hejna M, Liu Y, Percharde M, Wossidlo M, Blouin L, Durruthy-Durruthy J, Wong P, Qi Z, Yu J, Qi LS, Sebastiano V, Song JS, Ramalho-Santos M.
Cell Rep. 2016 Mar 15;14(10):2301-12. Unwind and transcribe: chromatin reprogramming in the early embryo. Biechele S, Lin CJ, Rinaudo PF, Ramalho-Santos M.
Curr Opin Genet Dev. 2015 Jul 13;34:17-23. Koh FM, Lizama CO, Wong P, Hawkins JS, Zovein AC, Ramalho-Santos M.
Chd1 is essential for the high transcriptional output and rapid growth of the mouse epiblast. Guzman-Ayala M, Sachs M, Koh FM, Onodera C, Bulut-Karslioglu A, Lin CJ, Wong P, Nitta R, Song JS, Ramalho-Santos M.
HiTSelect: a comprehensive tool for high-complexity-pooled screen analysis. Diaz AA, Qin H, Ramalho-Santos M, Song JS. A comparative encyclopedia of DNA elements in the mouse genome. Hira-Mediated H3.3 Incorporation Is Required for DNA Replication and Ribosomal RNA Transcription in the Mouse Zygote. Lin CJ, Koh FM, Wong P, Conti M, Ramalho-Santos M.
Dev Cell. 2014 Aug 11;30(3):268-79. Systematic Identification of Barriers to Human iPSC Generation. Qin H, Diaz A, Blouin L, Lebbink RJ, Patena W, Tanbun P, LeProust EM, McManus MT, Song JS, Ramalho-Santos M.
Histone variant H3.3 maintains a decondensed chromatin state essential for mouse preimplantation development. Lin CJ, Conti M, Ramalho-Santos M.
VitaminC induces Tet-dependent DNA demethylation and a blastocyst-like state in ES cells. Blaschke K, Ebata KT, Karimi MM, Zepeda-Martinez JA, Goya P, Mahapatra S, Tam A, Laird DJ, Hirst M, Rao A, Lorincz MC, Ramalho-Santos M.
Sachs M, Onodera C, Blaschke K, Ebata KT, Song JS, Ramalho-Santos M.
Sakaki-Yumoto M, Liu J, Ramalho-Santos M, Yoshida N, Derynck R.
Polycomb-like 3 promotes polycomb repressive complex 2 binding to CpG islands and embryonic stem cell self-renewal. Hunkapiller J, Shen Y, Diaz A, Cagney G, McCleary D, Ramalho-Santos M, Krogan N, Ren B, Song JS, Reiter JF. Qin H, Blaschke K, Wei G, Ohi Y, Blouin L, Qi Z, Yu J, Yeh R-F, Hebrok M, Ramalho-Santos M.
Incomplete DNA methylation underlies a transcriptional memory of somatic cells in human iPS cells. Ohi Y, Qin H, Hong C, Blouin L, Polo JM, Guo T, Qi Z, Downey SL, Manos PD, Rossi DJ, Yu J, Hebrok M, Hochedlinger K, Costello JF, Song JS, Ramalho-Santos M.
Open chromatin in pluripotency and reprogramming. Gaspar-Maia A, Alajem A, Meshorer E, Ramalho-Santos M.
Parallel gateways to pluripotency: open chromatin in stem cells and development. Koh FM, Sachs M, Guzman-Ayala M, Ramalho-Santos M.
Chd1 regulates open chromatin and pluripotency of embryonic stem cells. 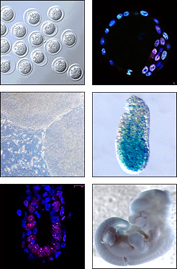 Gaspar-Maia A, Alajem A, Polesso F, Sridharan R, Mason MJ, Heidersbach A, Ramalho-Santos J, McManus MT, Plath K, Meshorer E, Ramalho-Santos M.
iPS Cells: Insights into Basic Biology. Comparative MobyDick for detection of cis-regulatory motifs. Chaivorapol C, Melton C, Wei G, Yeh R-F, Ramalho-Santos M, Blelloch R, Li H.
High-efficiency stem cell fusion-mediated assay reveals Sall4 as an enhancer of reprogramming. Wong C, Gaspar-Maia A, Ramalho-Santos M, Reijo Pera R.
Blelloch R, Venere M, Yen J, Ramalho-Santos M.
Grskovic M, Chaivorapol C, Gaspar-Maia A, Li H*, Ramalho-Santos M.
On the origin of the term ‘stem cell’. RNA interference in embryonic stem cells and the prospects for future therapies. Heidersbach A, Gaspar-Maia A, McManus M, Ramalho-Santos M.
Stem cells as probabilistic self-producing entities. Ramalho-Santos M, Yoon S, Matsuzaki Y, Mulligan RC, Melton DA. Zhang XM, Ramalho-Santos M, McMahon AP. Ramalho-Santos M, Melton DA, McMahon AP.